R. T. Turner, age 84, of Horse Cave, passed away on Monday, November 19, 2018, at The Medical Center of Bowling Green. He was a native of Hart County, an elder and member of the Horse Cave Church of Christ, lifelong farmer, U.S. Government Tobacco grader, tobacco warehouse manager, former insurance agent and a U.S. Army veteran. He was preceded in death by his parents, Joe Tom & Lovie Dobson Turner & one brother, Joseph L. Turner. He is survived by his loving wife of 50 years, Bonnie Walton Turner of Horse Cave; two sons, Rhett Turner (Angela), Mt. Juliet, TN, and Ryan Turner (Kristen), Lebanon, TN; four grandchildren, Shelby Turner, Jackson Turner, Dillon Turner and Alaina Turner, all of Tennessee; one cousin, Loretta Smith of Horse Cave; and several nieces and nephews. Funeral services will be held at 2 p.m. on Sunday, November 25, 2018 at Winn Funeral Home with burial to follow in the Horse Cave Municipal Cemetery with Military honors provided by DAV chapter #20 of Glasgow, Kentucky. 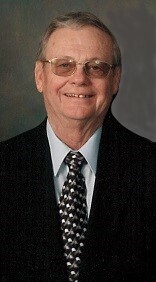 Visitation at Winn Funeral Home on Saturday, the 24th, from 2-8 p.m. and on Sunday from 8 a.m. until time of service. Expressions of sympathy may be made in the form of contributions to Southern African Bible College, c/o Horse Cave Church of Christ.